Urban Initiatives – Gunsaulus Visits the Chicago Red Stars! Gunsaulus Visits the Chicago Red Stars! The students from the UI Summer Camp at Gunsaulus had a reunion at the Chicago Red Stars soccer game. 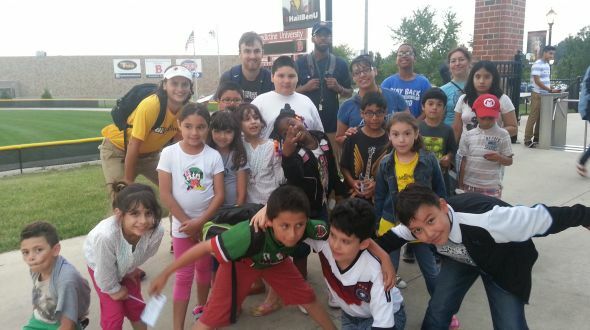 students, siblings, and a few parents loaded the school bus in Brighton Park and embarked on a trip to Lisle, IL to watch Chicago’s professional women’s soccer team do what they do best. When the group arrived, they were greeted by the Red Stars big blue mascot and family fun stations where students got to color, pick up snacks and enter drawings for goodies. The group made their way to the stands and were pleasantly surprised to see the score board already read 1-0 for the home team. The kids got some exercise by running alongside the field and playing near their seats. At half time, it was time for popcorn and healthy snacks like apples and granola bars. When the second half started up, some of the students hung back near the concession area to test out their kicking skills. One of the stadium employees had a radar gun to measure the speed of the soccer ball, so boys and girls lined up to see who could blast the fastest kick. By the time everyone finished exploring the stadium and cheering for the Red Stars, it was time to head back home. Just as the clock was running out and the group was heading down the bleachers, the Red Stars took a 2-0 lead! An exciting end to a very exciting trip. Thank you to the Chicago Red Stars for partnering with UI.